Lining, Underlining, Interfacing and Interlining – could you win the pub quiz? Not all garments are equal. With most high street clothes what you see is what you get. Just the fabric, the zip and the overlocking. If the garment has a collar, a waist band or a bit of structure then it will probably be depending on machine pressed interfacings, which are fused to the cloth before construction. If you are buying a coat or a jacket in may also have a lining – usually made of polyester – which is stitched into the garment when it is being manufactured, bagged out and stitched together crudely at the side seam or somewhere less obvious. For home dressmakers we have lots of choices in these matters. This post asks what lies behind the dress or jacket that you see? Some of the names for these under layers are similar and difficult to remember. Underlining Is a second layer of fabric that is cut in the same shape as your pattern pieces (often a little larger for speed – it can be trimmed off later). It is pinned to the fashion fabric, then basted along all the stitching lines and darts, and stitched with it – the two fabrics performing as one. The purpose of underlining is to give a little more structure to a garment, to stabilise it and to provide an underside onto which facings and hems can be invisibly attached. Some people like to make all the markings on the underlining so as to avoid marking the fashion fabric. Different fabrics can be used for this task. For example on a sheer fabric you could choose a sheer underlining like silk organza, or an opaque fabric like cotton lawn if you wanted more coverage. If you have a crisper fabric you may want a crisper underlining – I might use cotton organdie for this task. Also colour is important – while black and white underlining will serve most purposes there will be times when you want or need a different colour. For example you may back red lace with red polyester organza or dye white silk organza to match. I sometimes use habotai silk or a muslin cotton if the fabric is very soft. This is the underlying fabric (or fusible) that stabilises fabrics to stop them stretching out of shape. For example it is often invaluable to use a light weight fusible interfacing along the seam when you are inserting a zip or attatching buttons. Additionally on a dress or blouse the collar, cuffs and facings often require interfacing. You can use some of the same fabrics for interfacing that you use for underlining. For example with a very lightweight (say sheer or lace) blouse silk organza may be the best interfacing. But generally in order to get more body a woven interfacing or an iron-on product can be used. Personally I prefer sewn in, woven interfacing but there are times when fusibles work better. Most commercial patterns will specify what interfacing they recommend but experience allows us to match the fabric we have chosen with what we might already have in the drawer. I have five or six different weights of interfacing – a metre or so of each, both woven and non-woven, mainly in white, but some black too. I try to choose a similar weight with the right amount of crispness. 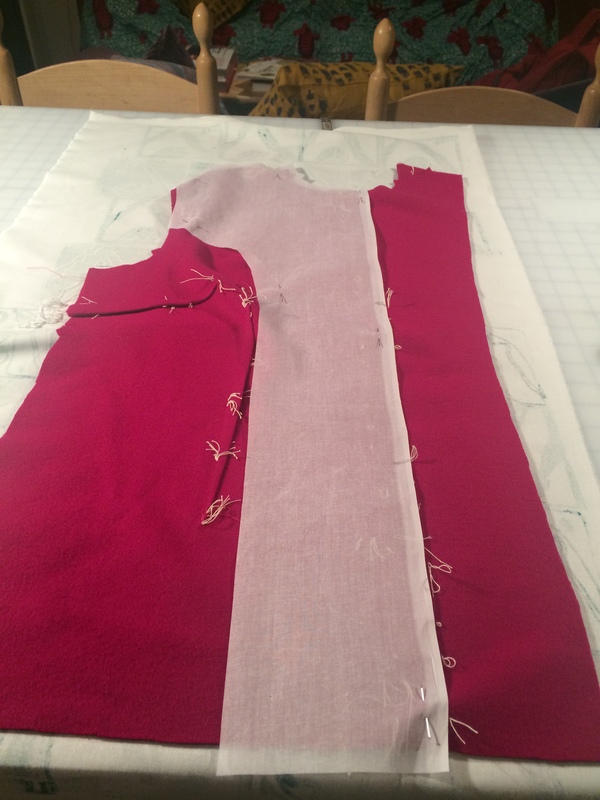 The best way to test is to put the interfacing over the back of your hand, and to drape the fabric over it. How does it feel and look? You can do a test square – fusing or basting – with a couple of options if you are not sure. For tailoring you need more support and body. This is because the sections of the garment, especially the collar, lapels, chest, upper back need to be supported and permanently shaped to fit the wearer. More specialist interfacing is required for a tailored garment and I tend to use cotton organdie on the lightest garments and horsehair (which I believe actually uses goat hair these days) interfacing for more structured garments. “Duck” is a type of linen canvas, and various other types of cotton such as calico and canvas can also be used. provides an opportunity to express your individuality – painted or coloured linings are exciting, even if only you ever see them when you step into your skirt. The key thing is to get the right quality and weight of lining for the garment. I admit I have often spent more on the lining than on the fashion fabric – I love getting good quality bargain fabrics for clothes, but I prefer to use silk for the lining and this is rarely available at a discount. I know many people use good quality man-made and synthetic fabrics for linings, and you can certainly get good results especially if you pay a little more. But for me I buy several metres of white silk and dye or paint it to match my outfit, plus some colours that I love. For a more robust and stable finish – say on a suit jacket – on a more important item I will use silk crepe. For a coat where slipperiness is important (or sometimes just in the sleeves) I prefer to use a silk satin. This is the most expensive and heaviest silk option I use. This is to provide warmth. It might be a good idea if you make say a winter coat from a lightweight wool. You just add in a layer of wool flannel, or possibly a fleecy type fabric (I have never tried a synthetic) – but it needs to be light weight, stable and warm but not bulky. If by any chance you were to make say a tailored coat with a slightly tricky but lightweight fabric (say an open weave Linton tweed) you may use all four under layers. They have a specific order, just like knives and forks at a posh dinner! Fashion fabric, underlining, interfacing, interlining, lining. Got it? This is really useful for me, K. I knew most of this but not everything. I will bookmark for future reference. A long time ago, when I used to buy RTW skirts, I was always frustrated by the lack of lining or by the synthetic fabric used. Both are not appropriate for hot and humid weather. Polyester sticking on thighs is just a nightmare.! I feel much happier now that I make my own skirts lined with cotton voile.I’m not familiar with silk lining but willing to try ! Very interesting Karine. I usually use cotton lawn for lining cotton or linen summer dresses. I was interested in the difference between lawn (rather soft) and voile (slightly crisper) and found out something about the French words. Lawn comes from Laon in France where linen lawn was manufactured and used by royalty or for church costumes. Voile comes from the Old French meaning veil. A great one to file away for future use – thank you Kate! Very informative. Love your blog.